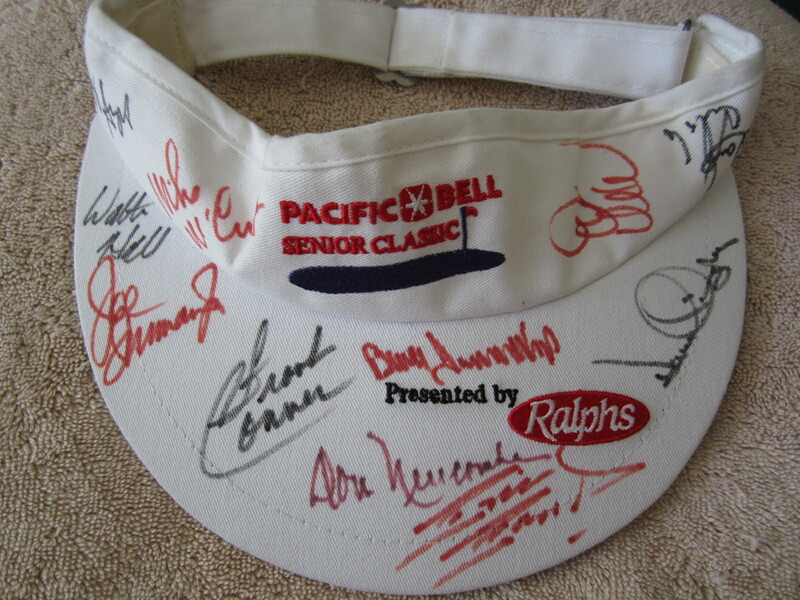 White 1998 or 1999 Pacific Bell Senior Classic embroidered golf visor autographed in black or red marker by 10 golfers from this Champions Tour event played at Valencia Country Club (tournament champion Joe Inman, Frank Conner, Bruce Summerhays, Dana Quigley, Walter Hall, Mike McCullough and 4 unidentified), plus in magenta marker by former Dodgers Rookie of the Year, NL MVP and Cy Young winning pitcher Don Newcombe who probably played in the Pro-Am. Obtained in person at the tournament. Has very minor wear. With certificate of authenticity from AutographsForSale.com. ONLY ONE AVAILABLE FOR SALE.